Are we heading for a future populated by robotic police officers? Over in Dubai, the largest city in the United Arab Emirates, that scenario could become a reality sooner than expected. The emirate is set to introduce the first robotic law enforcement agents tomorrow; a step toward the ultimate plan for robots to make up 25 percent of its police force by 2030. 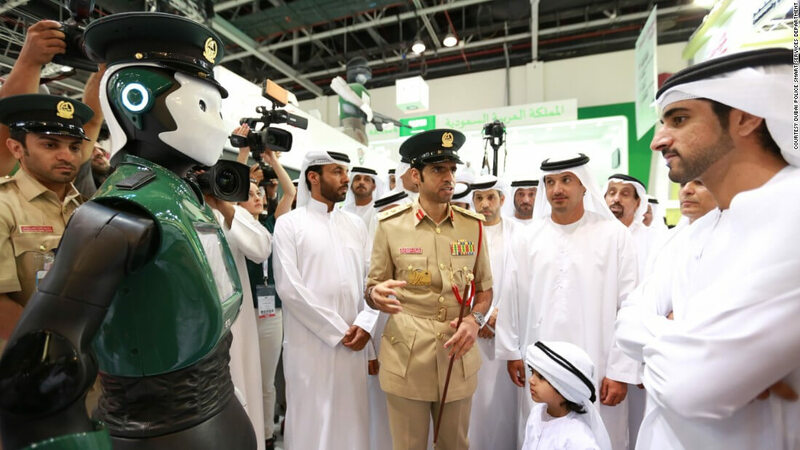 The adapted REEM robot, which measures around 5 feet five inches high and weighs 220 pounds, was shown off at the Gulf Information Security Expo and Conference on Sunday. It’s designed by Spanish company PAL Robotics, and while it can’t chase or arrest suspects – it’s not quite Robocop, yet – the machine’s facial recognition technology can help police identify and catch offenders - though it’s still only 80 percent accurate. It also features cameras that send a live feed back to the control center. The model is an upgraded version of the prototype unveiled at Dubai’s electronic trade show GITEX last year. It comes with a tablet built into its chest that allows people to report crimes, access public police information, and pay traffic tickets with their credit cards. The extent of the improvements are unclear, but Dubai’s Police Force has been working with Google, as well as IBM’s Watson AI system, on its voice recognition capabilities. The autonomous robot can communicate with people and answer questions in six different languages. It can even detect a person’s emotional state and can respond accordingly. The aim is for the robots to eventually become advanced enough that they can operate as full police officers. "With an aim to assist and help people in the malls or on the streets, the robocop is the latest smart addition to the force and has been designed to help us fight crime, keep the city safe and improve happiness levels," said Brigadier-General Khalid Nasser Al Razzouqi, director-general of smart services at Dubai Police, according to the Khaleej Times. It remains to be seen how the public will feel about reporting crimes to a robot. Hopefully, it won’t get punched to the ground like the K5 security robot in Mountain View, California recently.